Susan Davidson, Farragut Middle School girls basketball head coach, still remembers her team’s first game of the season loud and clear. It was an in-school game at Karns. Since then, it’s been full speed ahead for the Lady Admirals, who won their next 12 league games in a row to capture the Knox County regular season championship. Farragut capped it with a 35-19 victory at Bearden Thursday. Macy Barnes and Ace Strickland led the way with 12 points apiece. Kate Priest chipped in four points. Alexis Porter tallied 10 for Bearden. As it turns out, Farragut’s first game in the upcoming post-season league tournament will be back at Karns in the quarterfinals Saturday. “It’s a new season for everybody now,” said Davidson, who also is head volleyball coach at Farragut High. “The league’s over. Everybody is 0-0. Four of Davidson’s five “key leaders” this season have been seventh graders. Barnes is the lone eighth grader in that group. The seventh graders are Strickland, Priest, Ella McFerran and Ashlynn Sheridan. “Those five have been core on helping coach the younger players up,” pointed out Coach Davidson. Another key player for Farragut has been Alexis Kochenderfer, an eighth grader. Hayley Prince, a key seventh grader, has been sidelined with a wrist injury since the holidays. Farragut, 16-4 overall, bothered Bearden with its full-court press and built a 16-0 lead before the Lady Bruins got on the scoreboard. The Lady Admirals also utilized an effective 1-2-2 zone in the half court. It was 20-7 at halftime and 25-14 after three stops. Davidson currently is in her seventh season coaching FMS girls basketball and her 2014-15 team also won a league crown. She also was at FMS earlier in her coaching career when her 2004-05 and 2006-07 squads captured the league title. 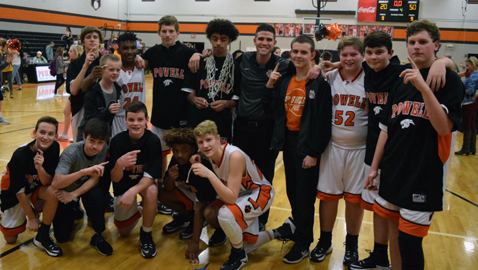 Meanwhile, Powell (12-1, 21-1) rolled past Whittle Springs 50-20 Thursday to wrap up the boys’ crown, the fifth for Darin Courtney in his 15 seasons as the Panthers’ head coach. “A regular season championship in our league is precious,” said Courtney. “It’s earned over a four-month period in a league that has a lot of outstanding coaches and talent. South-Doyle defeated Vine Thursday to get the No. 2 seed in the boys bracket. Carter earned the No. 2 seed in the girls bracket. The top two seeds receive byes in the first round. Girls’ first-round games Thursday, beginning at 4:30, match Whittle Springs at West Valley, Northwest at Powell, Cedar Bluff at Karns, Vine at Halls, Holston at South-Doyle and Gresham at Bearden. Boys’ first-round games Friday, starting at 4:30, will pit Cedar Bluff at Vine, Halls at Bearden, Whittle Springs at Farragut, Holston at Karns, Gresham at Carter and Northwest at West Valley. The remainder of the tournament will be played at Karns, with quarterfinal games starting Saturday morning at 10. Semifinal games will be Tuesday (Feb. 7), with the consolation and championship games on Thursday (Feb. 9).